Shop eBay the easy way. 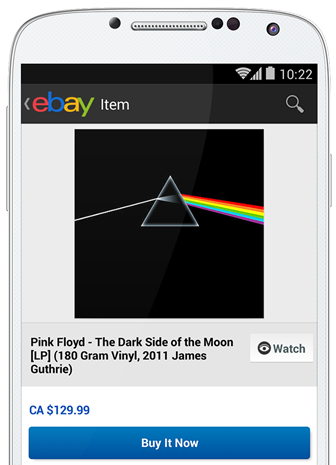 Buy on eBay now or bid instantly on anything under the sun. We securely process every single purchase with ease. Shop eBay around the world, bid on anything or Buy It Now. Pay on eBay however you want without revealing your financial information. Then go about your business, your purchase is on its way! Buy or sell on eBay with ease. eBay is the perfect place to buy, sell, and browse. Search by category and find your next treasure or sell your wares and make someone’s day. Shop eBay with peace of mind. If your item doesn’t show up or is different than described, your eligible purchase will be protected by PayPal Purchase Protection. Pay on eBay with any card. Pay on eBay with any credit card, bank account, PayPal balance, or Visa Debit card. The choice is yours. Simply choose at checkout and get on with your day. No matter what currency you prefer, you can shop from millions of sellers around the world. We accept 25 currencies from 202 countries and markets and do the conversion for you for a small fee. We bring buyers and sellers together, reducing steps, costs, and chaos. This is one marketplace that’s always open and ready for you. 1 One pair of shoes is sold every two seconds on eBay. PayPal lets you foot the bill faster. Buying with us is free.